Parents are encouraged to talk to their kids about money -- especially credit -- at an early age. Hopefully, by the time children graduate from high school and head off to college, they have a good grasp of personal finance. If that knowledge is a little thin in places, the time between graduation and college enrollment is a good time to increase their knowledge about credit. A recent survey by Equifax found that nearly 70% of college students carry at least one credit card. It's a convenient way to cover expenses and emergencies, but if students run up balances they don't pay off each month, they may graduate with crushing credit card debt, to go along with their crushing student loan debt. The first thing parents should stress to their college freshmen -- you have to live within a budget. Whether you are paying for things with cash or a credit card, you can only spend money that you have. When you start spending money you don't have, that's where you run into trouble. When spending with a credit card, students must pay the bill and pay it on time. Missed or late payments will drag down a credit score. Many credit cards have features to help users stay on top of their spending and within budget. Discover's student cards have a Spend Analyzer to track spending and to alert them when they're going overboard in certain categories, like restaurant meals. Mobile payment and personal finance apps also come with helpful budgeting features. International Business Times recently profiled three -- Venmo, Mint, and Wally. Mint and Wally are personal finance apps that let you set targets for certain categories of spending, then track what you spend. Venmo lets you send money online to friends and family. 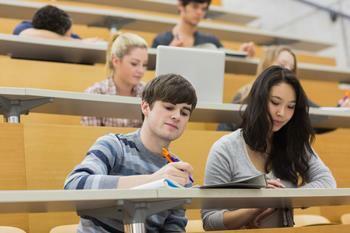 Colleges are also beginning to offer more financial counseling for students. The University of California Davis offers 40 money management tips. They include using care when taking out student loans, keeping money in a bank, and creating a spending plan. A financially literate college student will probably be a savvy consumer. Instead of going to the college book store and buying a new copy of a needed text book, he or she will likely look around for used copies at much less cost, or even download them on a Kindle or iPad.